Part of the reason why vaccination is challenging is because social networks play a critical role in disease transmission. Even if enough people have been vaccinated in aggregate to obtain herd immunity in theory, it may not be enough if there are hot spots of unvaccinated children who can cause outbreaks. There are hot spots in some areas in California and other states that have generous exemption policies. record levels of vulnerability to highly infectious diseases. The CDC estimates that 95% of kindergarteners have had MMR and DTaP immunization and 93% have had varicella (chicken pox) immunization. [Link] And yet there are outbreaks! The CDC’s immunization goal is 95%. Given that some kids truly should not be immunized (like those with specific allergies or those who have had serious reactions to other vaccines), there isn’t much room to allow for parents to choose to opt out while maintaining herd immunity. In fact, just a few people opting out has been linked to several disease outbreaks [Links here and here]. This is especially critical for newborns, who cannot be immunized for anything except Hepatitis B, and babies under a year old who cannot get the MMR vaccine for the measles. There is a measles outbreak among babies who cannot be vaccinated against the measles yet in a Chicagoland day care. In other words: please vaccinate your children if you can. Despite having record levels of immunization, we’ve seen a lot of cases of pertussis, measles, and other infectious diseases. It’s all about social networks! Let’s return to herd immunity. Estimates from Wikipedia indicate that most diseases require an immunization rate of 85%-94% (the herd immunity threshold) in a “well mixed” population to achieve herd immunity. In other words, this might be an optimistically low threshold when kind of ignoring social networks. An article in The Atlantic reports a 92% herd immunity threshold for most diseases and a 95% herd immunity threshold for highly infectious diseases like the measles (they cite a World Health Organization document). A population being well-mixed is a big assumption. Kids within the same school may travel in different social circles that are more homogenous than the school as a whole. That’s important. A social circle that has a low level of immunization may introduce risk to the kids in the community even if the school as a whole is above the herd immunity threshold. That’s what happened in the Chicagoland day care with the unvaccinated babies who hung out together every day. But more generally, people who don’t vaccinate generally have friends who also don’t vaccinate. The Guardian has a nice simulation about herd immunity and social networks. They consider a few different communities with different vaccination rates (from 10% to 99.7%) with vaccinated, unvaccinated (susceptible) and vaccinated but susceptible individuals (the CDC estimates that MMR only “takes” in 93%-97% of those vaccinated). A few random individuals then come in contact with the measles. The red individuals represent infections. There are measles outbreaks even with a 90% vaccination rate. 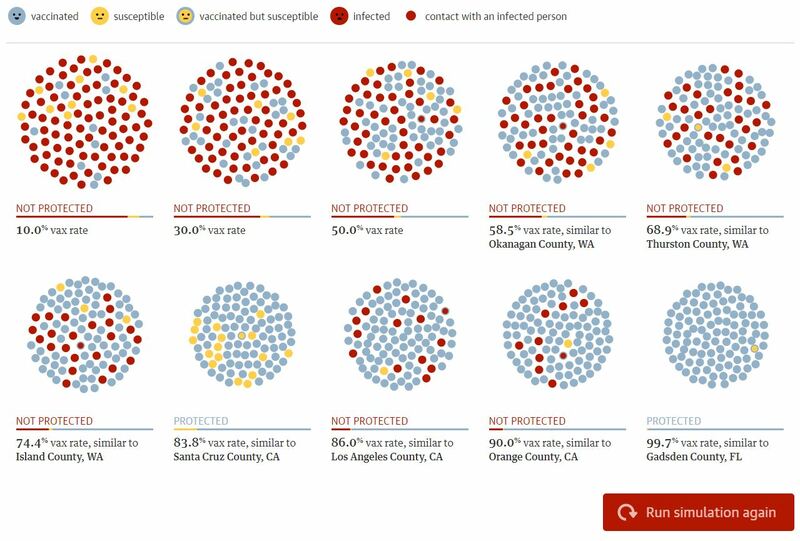 The Guardian simulation results for exposing a community to measles. Sometimes a vulnerable community is OK (see the 83.8% vax rate here) but in general there is an outbreak. The Guardian provides a nice figure of deadliness (the y-axis) vs. the basic reproduction numbers (the x-axis) of various diseases. That cluster of diseases on the right hand side is composed of highly infectious. Measles, rotavirus, whooping cough are highly infectious in ways that the seasonal flu just isn’t. In fact, the CDC recommends vaccines for that entire cluster of highly infectious diseases over there on the right except for malaria (which isn’t a huge problem in the US) because they are really that bad. Deadliness vs. Basic Reproduction Number. I get the impression we keep having these debates without agreeing on what the problem is and what its consequences are. It’s reasonable to say that most people in my generation have no idea what a massive infectious disease outbreak looks like. It’s not like the seasonal flu, where you know just a few people who succomb to the flu every year but you’re usually OK. With these highly contagious diseases, outbreaks may be rare but then BOOM, everyone you know is sick. Chicken pox (R0 = 8.5) may be an exception. The chicken pox epidemic in my kindergarten class was the only time I experienced a massive infectious disease outbreak (class attendance dwindled to 3-5 students for a few days). I’ll stop here for now. Let me know your thoughts on vaccination, social networks, herd immunity, and disease outbreaks. The most recent issue of Interfaces (Jan-Feb 2015, 45(1)) has an article about eradicating polio published by Kimberly M. Thompson, Radboud J. Duintjer Tebbens, Mark A. Pallansch, Steven G.F. Wassilak, and Stephen L. Cochi from Kid Risk, Inc., and the U.S. Centers for Disease Control and Prevention (CDC). 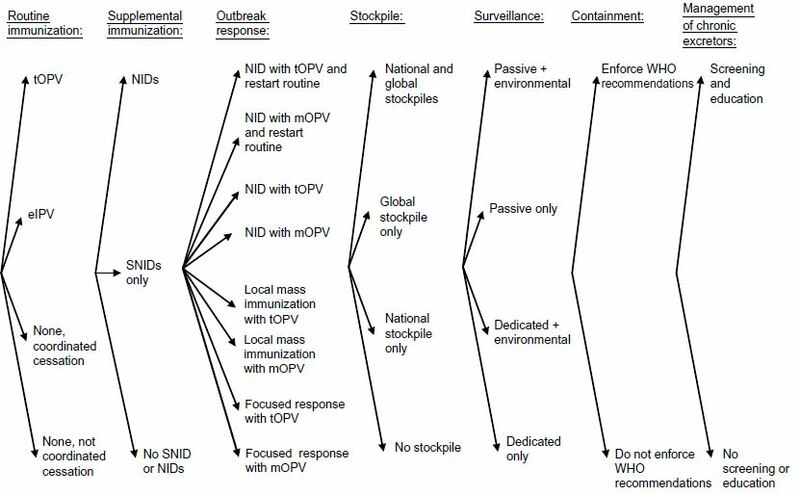 This paper develops and applies a few analytics models to inform policy questions regarding the eradication of polioviruses (polio) [Link to paper]. The article is timely given that vaccination is in the news again. At least this time, the news is fueled by outrage over GOP Presidential contenders Chris Christie and Rand Paul’s belief that parents should have the choice to vaccinate their children [example here]. Polio has essentially been eradicated in the United States, but polio has not been eradicated in the developing world. The Global Polio Eradication Initiative (GPEI) helped to reduce the number of paralytic polio cases from 350,000 in 1988 to 2,000 in 2001. This enormous reduction has mainly been achieved through vaccination. There are two types of vaccines: the live oral vaccine and the inactivated vaccine (IPV). Those who have been vaccinated have lifelong protection but can participate in polio transmission. What vaccine (if any) should countries use after wild polioviruses (WPV) eradication, considering both health and economic outcomes? What risks will need to be managed to achieve and maintain a world free of polio? At the time of the 1988 commitment to polio eradication, most countries expected to stop polio vaccinations after WPV eradication, as had occurred for smallpox. Would world health leaders still want to do so after the successful eradication of WPVs? Over the last decade, the collaboration innovatively combined numerous operations research and management science tools, including simulation, decision and risk analysis, system dynamics, and optimization to help policy makers understand and quantify the implications of their choices. These integrated modeling efforts helped motivate faster responses to polio outbreaks, leading to a global resolution and significantly reduced response time and outbreak sizes. Insights from the models also underpinned a 192-country resolution to coordinate global cessation of the use of one of the two vaccines after wild poliovirus eradication (i.e., allowing continued use of the other vaccine as desired). 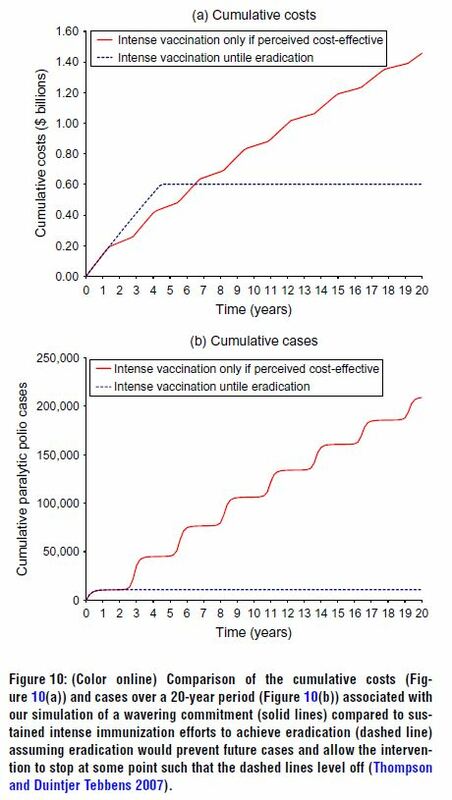 Finally, the model results helped us to make the economic case for a continued commitment to polio eradication by quantifying the value of prevention and showing the health and economic outcomes associated with the alternatives. The work helped to raise the billions of dollars needed to support polio eradication. 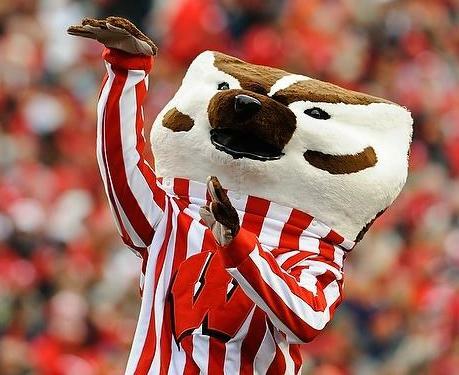 In full disclosure, I’m a big fan of immunization. All of my children are fully vaccinated. My grandmother was born in 1906 and used to tell stories about relatives, so many of whom ultimately died of infectious diseases (Grandma lived until she was ~102!). I’m glad my kids don’t have to worry about getting many of these diseases. I’m also proud to contribute to herd immunity. We come in contact with people who have compromised immune systems or could not get immunized, and I’m glad we’re playing our part in keeping everyone else healthy. Part of the reason why vaccination is challenging is because social networks play a critical role in disease transmission. Even if enough people have been vaccinated in aggregate to obtain herd immunity in theory, it may not be enough if there are hot spots of unvaccinated children who can cause outbreaks. There are hot spots in some areas in California and other states that have generous exemption policies. I recently read an article on Forbes about a forthcoming JAMA article about screening test uncertainty and invasive medical procedures [Link]. In the study [Study Link], the researchers gave 727 men hypothetical PSA scores for screening for prostate cancer. The control group was not given a PSA result. Those who not in the control group were given one of three outcomes, leading to four groups. Men in each group were asked if they would pursue a biopsy, an invasive and expensive medical procedure compared to the PSA test. Groups 2 and 3 are similar in that they don’t have conclusive of cancer. However, group 3 has more uncertainty. The issue here is that an inconclusive test gives the same information as doing no test at all, yet those with an inconclusive test want to get a biopsy at a higher rate. In the study, the biopsies are requested by the patients, but in real life, doctors often turn inconclusive tests into expensive and invasive medical procedures. I had a few other reactions to the issues associated with screening for disease. With limited resources, inexpensive screening in theory helps to keep health care costs down. A cheap test is supposed to be used to weed out some of the population that does not need more invasive screening test. If disease cannot be ruled out, it may make some sense to retest. Of course, the issue here is that biopsies are chosen at different rates for different inconclusive patients. The results of this study suggests that screening for disease starts a process that is hard to turn off – screening could result in more men being biopsied instead of fewer. This isn’t just an issue with PSA tests. I also found it interesting that 13% of the population apparently refused to be weeded out. Humans do not do a good job of figuring out how to effectively use resources to screen for and manage disease. And as we see in this study, humans do not always make better decisions with better information. This is why we need good models of disease and its treatment. With those models in place, we can explore how to effectively target limited healthcare resources at the patients who most need them. This is a growing area for operations research – identifying how to make good decisions at the patient level for understanding when to do more testing and when to take a wait-and-see approach. For slow-growing cancers such as prostate cancer, a wait-and-see approach may be a good one most of the time (disclaimer: for what it’s worth, I’m not a medical doctor). Waiting and retesting was not an option considered in the study, and maybe the results would be different. A wait-and-see approach is often used for other types of cancers, such as for pre-cancerous legions that could lead to cervical cancer. For more reading about screening policies, inaccurate screening tests, and unnecessary treatment, read this NY Times article about breast cancer: [Link] Breast cancer can be quite aggressive, especially when it affects younger people, and it is common. I’ll admit that delaying or avoiding mammography is hard to fathom. The article highlights how aggressive mammography policies have led to the discovery of more cancerous and pre-cancerous legions (and thus cancer survivors) but it has not led to higher cancer survival rates. Other issues such as self-exams are also discussed. I’m looking forward to learning about the latest research in this area at the INFORMS Healthcare Conference in Chicago this summer [Link]. I hope to see many of you there. In October, This American Life produced two interesting episodes about health interventions and evidence-based medicine that I am just listening to now. These This American Life shows seem fresh and interesting, largely because they try to discuss health insurance/care issues from a quantitative, evidence-based perspective, even though cite few numbers in the episodes. To illustrate this point, part of the first episode is even titled “Every CAT scan has nine lives,” referring to the side effects of over-using advanced medical techniques such as CAT scans. The More is Less episode is particularly interesting for OR folks. It starts with a twenty-minute discussion of some of the cost and effectiveness problems with health care. The episode steps through one of the problems that grappled the medical community from the 1970s: geographic disparities in hysterectomies and other medical procedures in Maine and Vermont. This baffled the doctors, since the disparities in hysterectomies across the state could not be explained by demographics, age, religion, or other factors, as was initially suspected. One of the doctors who performed some of the analysis (Wennberg) concluded that 70% of women would receive hysterectomies in some communities. Maine doctors concluded that disparities were in part based on the doctors choosing to over-perform certain surgeries rather than the patients asking for procedures. The episode continues to discuss why performing more medical procedures leads to more side effects and potential destruction in some cases, including the PSA tests for prostate cancer, thus exploring the tradeoff between cost and effectiveness. These issues have been in the news quite a bit lately, particularly with the chance in mammogram screening recommendations. These discussions in the news have included too much pandering and too little math and analysis, for the most part. I’ve struggled to find good resources for a lay audience that address the numbers, so this episode was much appreciated. I’ll leave the rest of the episode a mystery, so you can listen to it yourself. The second episode (Someone Else’s Money) is not nearly as good, but examines health insurance in more detail. Podcast Links: More is Less and Someone Else’s Money. Link: The Numbers Guy (WSJ) on Mammogram Math is also an interesting read. Have you found any good references on lay explanations of the numbers behind health care and health insurance? The human brain, Eddy explains, needs help to make sense of patients who have combinations of diseases, and of the complex probabilities involved in each. The article describes many of the challenges in the medical domain as well as some of the benefits of using advanced analytical methods for approaching medicine. [Eddy’s] PhD thesis made front-page news in 1980 by overturning the guidelines of the time. It showed that annual chest X-rays and yearly Pap smears for women at low risk of cervical cancer were a waste of resources, and it won the most prestigious award in the field of operations research, the Frederick W. Lanchester prize. Based on his results, the American Cancer Society changed its guidelines. The recent changes in how we screen for prostate cancer and breast cancer are part of Eddy’s legacy. They are controversial, but few medical treatments have been proven in clinical trials (the article estimates this could be as low as 20%). This is the second of three posts about the INFORMS Annual Meeting. Reneging on vaccinations (some health care workers are refusing required vaccinations). Timing the vaccinations (before the prevalence peaks) is important for reducing risks, since youths are particularly susceptible to dying from H1N1.. Locating facilities to manage surge capacity when the epidemic hits. Correctly diagnosing and isolating cases of H1N1. Larson and his collaborator Dr. Stan Finkelstein takes a different kind of focus, looking at personal choices, such as hand washing, coughing into sleeves, avoiding handshakes, and avoiding crowds. They examine this issue through non-pharmaceutical interventions. Someone infected with H1N1 infects about 1.5 people in the next 24 hours (on average). This value is the mean of a random variable, which depends on personal choices (like handwashing). He examines the conditions under which the average number of infections decreases below 1.0, when the virus essentially dies out (Similar to my reasoning on vampire populations). Finkelstein, a medical doctor, discussed some of the policy results. Initial reports suggested that H1N1 has a fatality rate of about 50% (Spanish flu has a FR of 3%). After an initial panic, flu fatigue set in. And the first wave of H1N1 resemble seasonal rather than pandemic flu. But after the recent panicking, many of us simply have not been motivated to improve our personal choices to reduce H1N1 transmission. Case in point, elbow bumping pictured below (instead of hand shaking) did not catch on at the conference as I had hoped. And the anti-bacterial hand gel was not located in useful places at the conference, so I used my own personal stash of anti-bacterial lotion after shaking hands. I hope some of this research is used to lessen the impact of H1N1 this year before I am transformed into a germ-a-phobe. Karima Nigmatulina, after successfully defending the first PhD thesis on our flu research project, bumps congratulatory elbows with advisor Richard Larson. After attending the second day of the Virginia Health Equity Conference, I have been convinced that public health is a function of much, much more than just medical treatment. Paula Braveman provided some figures in her keynote that indicate that the mortality and incidence rates of many infectious diseases drastically reduced before effective medical interventions were introduced. I had heard this before, but a picture is worth a 1000 words. I tracked down a few of the images online (see below). Public health initiatives such as housing, ventilation, improved sewage systems, and education improved health outcomes much more than medical interventions that were later introduced. This reflects the fact that there are many good proxies for public health that reflect infrastructure, networks, and transportation, all of which are things that we like to evaluate in operations research models. It strikes me that any operations research models that reflect public health would fit in well with community-based OR initiative. Those who do research in this area might be interested in a new Springer volume. The call for papers is pasted below (I could not find a link). Note that I am not affiliated with this effort. Proposals for manuscripts on the topic of Community-Based Operations Research are being solicited for an edited volume to be published in the Springer International Series in Operations Research and Management Science, as part of the Advancing the State-of-the-Art handbook series. “Community-based operations research” (CBOR) is defined as the collection of analytical methods applied to problem domains in which interests of underrepresented, underserved, or vulnerable populations in localized jurisdictions, formal or informal, receive special emphasis, and for which solutions to problems of core concern for daily living must be identified and implemented so as to jointly optimize economic efficiency, social equity, and administrative burdens. This domain was first discussed in a chapter in Tutorials in Operations Research 2007 – OR Tools and Applications: Glimpses of Future Technologies (INFORMS 2007) by Johnson and Smilowitz and subsequently in an article that appeared in the February 2008 issue of OR/MS Today. As community-oriented operations research, as defined here, is central to the mission of the Section on OR/MS Applied to Public Programs, Service and Needs, submissions from SPPSN members will be especially welcome. Chapters in this volume can describe current results for a specific research problem, a literature review, or a discussion of the nature of CBOR within the operations research/management science discipline. Proposals for submissions to this volume should be not more than one page in length, describe the nature of the submission, and clarify if the submission is likely to be based on current or on-going research, a new research project, or synthesize previous findings. Submissions will be peer-reviewed. The deadline for submission proposals is October 16, 2009. The deadline for chapter submissions is February 1, 2010; final drafts of chapter submissions will be sent to the publisher on August 1, 2010. Link to yesterday’s post about the conference.